Paying tribute to Europe’s stunning estates, Abigail Garden features seven splendidly tiered rows of lush blossoms, citrus accents, and regal purple blooms. 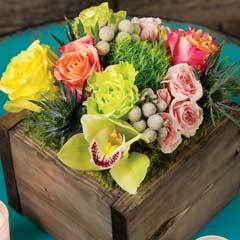 Nestled in moss and artfully arranged in a dark stained hand crafted wood crate, Abigail Garden measures approximately 10 ½" x 10" x 7 ½" to top of arrangement and requires next day shipping. 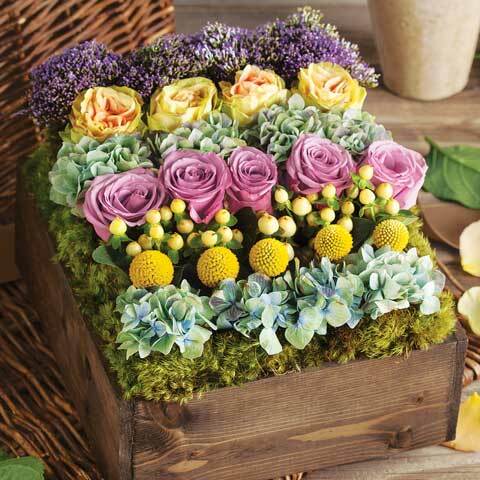 Abigail Garden is a fresh cut floral arrangement. Abigail Garden is rated 4.8 out of 5 by 5. Rated 5 out of 5 by Rita O from A stunning gift I sent the Abigail Garden to my sister and brother-in-law recently. What a result! 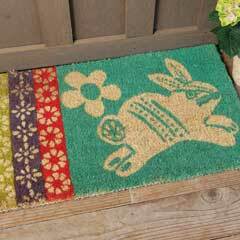 They were simply awed and delighted and, trust me, they are used to gorgeous arrangements. Thanks, Olivia & Cocoa. Rated 5 out of 5 by Mickiw from Exquisite! This was an absolutely stunning floral piece. It brought smiles to my granddaughter as she was completing pre-op tests as she faced a major surgery. There couldn't have been a more beautiful, peaceful gift! Rated 5 out of 5 by LJMB from Unusual, very stunning floral arrangement I recently received a stunning floral arrangement for my birthday. 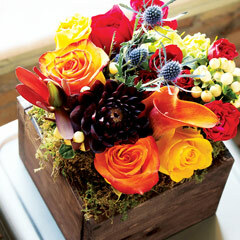 Upon opening the box, I saw that it had been carefully packaged so the flowers had lots of room and weren’t crushed. The display was really imaginative. The friend who sent it obviously did some careful research to find something unusual and your arrangement was striking. 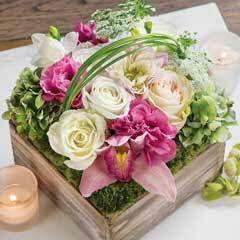 It consisted of beautifully placed rows of colorful roses, hydrangeas, heather and other greens which were carefully inserted into a rustic wooden box. Days later the arrangement is still fragrant and gorgeous and many friends have commented on it. Rated 4 out of 5 by davisj2 from Beautiful Arrangement Received this as a birthday gift. Truly beautiful but, on mine, yellow roses are on the end and appears to be wilting faster than the rest of the arrangement. Perhaps need more/more efficient water supply. Olive & Cocoa always delivers unique and gorgeous arrangements. No exception here. Rated 5 out of 5 by Beth R from Perfection! I've now purchased this arrangement twice for a gift. Fresh fresh fresh flowers! Amazing packaging! Perfection!